The open construction GTEC combines reliability and flexibility to varied applications for load transfer. 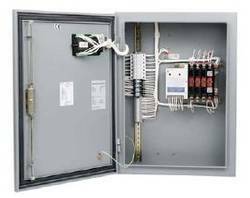 The open construction is provided with the same rugged switch mechanism, din rails, relays, and control as the standard GTEC. The PowerCommand® micro-processor control monitors utility and emergency standby generator set power. When utility power fails or is unsatisfactory, the control starts the generator set and transfers the load from the utility to the generator set. Once utility power returns, the switch automatically transfers the load back to the utility. The fully integrated controller is designed for practical functionality, inclusive of LED indicators and digital pushbuttons for ease of operator use. GTEC automatic transfer switches are available in a full range of sizes from 40 amps up to 2000 amps. Meeting the standard of IEC 60947 and a CE certified product, GTEC is a compact, economical, transfer switch capable of performing open or programmed transitions between a utility and a generator set, or between two generators. The switch consists of a dedicated mechanism with break-before-make action and a microprocessor-based control with advanced built-in control features capable of monitoring utility and emergency standby generator power. When utility power fails or is unsatisfactory, the control will start the generator and transfer the load from the utility to the generator. The intelligent microprocessor control also features advanced time delay functionality and an operator panel with easy-to-use push button controls as well as LED indicators that show the system’s status at a glance. GTEC is field-configurable for open or programmed transitions. Other features include a standard removable handle for manual operation and positive interlocking, which prevents source-to-source connection through the power or control wiring. GTEC uses silver alloy contacts with multi-leaf arc chutes, which are rated for 100% load interruption with no requirement for routine contact maintenance and provide 100% continuous current ratings. Furthermore, its single-plug harness connection and compatible terminal markings makes it easy to service.